“If I hadn’t wanted her, I wouldn’t have married her.” That’s how Gene Coleman explains the success of his 77 years of marriage to his wife, Eleanor. “When we married, we married for keeps,” said the 96-year-old Coleman, who says a good day for him is when he can put both feet on the floor when getting out of bed. Gene, a native of Colbert, first saw Eleanor at a church pie supper in Platter, Eleanor’s hometown, in 1928. But the Lord works in mysterious ways. On Easter Sunday the next year, Gene’s friend needed someone to go with him to Platter. He was dating a girl there, and she had a friend he wanted to set Gene up with. And that girl turned out to be-Eleanor. “The next day was April Fool’s Day, so I played hooky from school and went to see her,” Gene said. For the next few months, Gene frequently walked eight miles from Colbert to Platter and back to see Eleanor. They were married Nov. 28, 1929. The wedding was performed by the Baptist preacher in Colbert. Eleanor and her family attended the Methodist Church in Platter, but she was saved, at age 11, in a Baptist church. Conversely, Gene, a member of the Baptist church in Colbert, was saved during a revival at a Methodist church when he was 13. The couple moved to Fort Worth, where Gene had been promised a job. However, because it was the beginning of the Depression, the job didn’t work out. They stayed in Fort Worth a year before moving back to Colbert. Gene said he never went without a job, although he only made $1 a day for 10-12 years. He operated a peanut shelling plant in Colbert, when the plant was moved to Bristow in 1940. In Bristow, the Colemans joined First Church, where they have been active for more than 60 years. Gene worked at the peanut plant for 12 years, then joined the Turnpike Authority, where he was employed for 23 years. The Colemans are parents of three sons, Joe, a jeweler in Midland, Texas; Jim, who died of a heart attack after spending 23 years in the army in Vietnam, Korea and Germany; and Harold, a retired naval officer living in Jacksonville, Fla. They also have five living grandchildren (one died of a heart attack, one from cancer), 10 great-grandchildren and three great-great-grandchildren. Eleanor said she learned early, when the going gets rough, two can live together cheaper than one. The Colemans do have advice for those considering marriage. The Tulsa State Fair annually honors couples who have been married 50 or more years. Last year, Gene and Eleanor won the award for being married the longest. The thing Gene is proudest of is that he is the only photographer Edna McMillan, who was a member of Bristow, First, would let take her photograph. The picture is hanging in the parlor at First Church, which is named for McMillan, for whom the Oklahoma State Mission Offering is named. 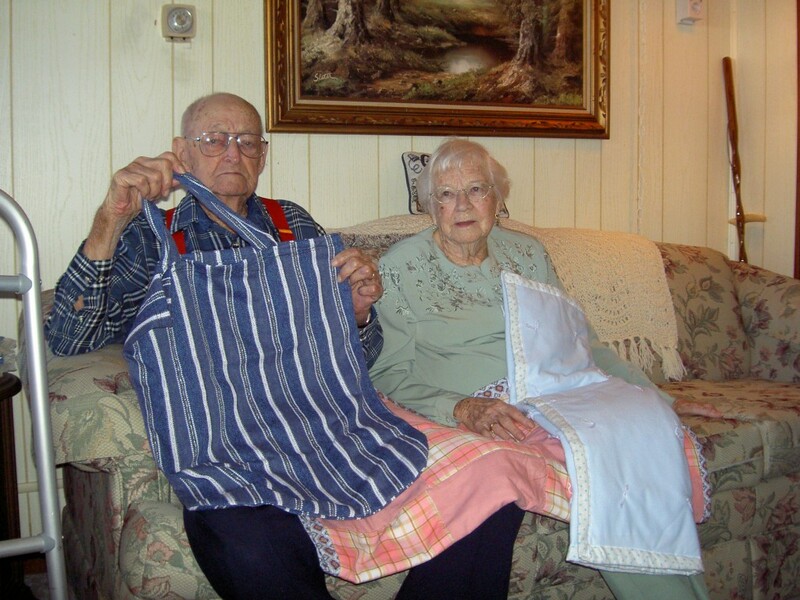 At ages 96 and 94, Gene and Eleanor keep busy making lap robes for nursing homes and veterans’ hospitals, tote bags for patients leaving the hospital and quilts for Tulsa’s Hope Pregnancy Center. Eleanor is not able to see well enough anymore to sew the items, so she places the squares of materials together and Gene does the sewing. Gene, a jack of many trades, admitted there is only one thing he can’t do, but he wouldn’t reveal what it is, saying he will conquer it before he dies. “We hope to be useful as long as we live,” said Eleanor.